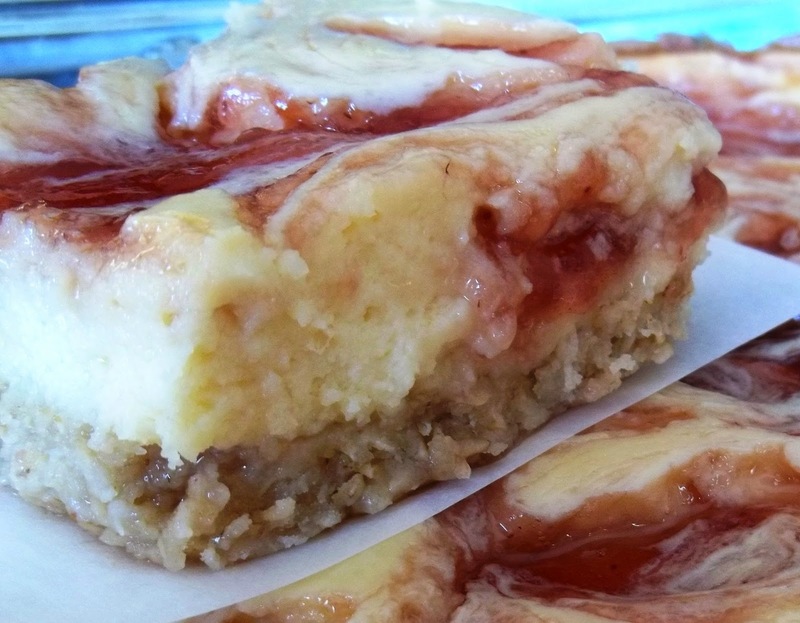 Creamy cheesecake with a strawberry jam swirl layered onto a soft oatmeal cookie crust. Need I say more? the fulfillment to that craving. A soft oatmeal cookie crust topped with a creamy layer of cheesecake swirled with strawberry jam, yummy on the first day, even better the second day. Don't you love when you discover a recipe that is even better on the second day? I am always excited to be able to add a new recipe to my "Make Ahead Dish" file. Oh yeah and to make these even sweeter, they can be made in one bowl. Yep, one bowl, you read that correctly. The oatmeal layer comes together so cleanly, the same bowl can be used to mix the cheesecake layer. Keeps getting better, doesn't it? I used strawberry jam for the swirl because it is one of my favorites. Your favorite jam can easily be substituted here. Or nutella, peanut butter, or almond butter. Maybe your preference would be no swirl, that is ok too. Or no swirl, but add in chocolate chips, white chocolate chips or nuts. Have fun and add in whatever it is that will make this your perfect one bowl, make ahead dessert! Next go, I'm trying a nutella swirl. What will be your swirl or add in choice? I am waiting to hear your ideas for swirl or add in ideas! A favorite at Teach Me Tuesday Linky Party at 3GLOL! In a stand mixer with paddle attachment or with hand mixer, cream butter and sugar until fluffy. Add flour and oats, mix to combine. Pat mixture evenly into bottom of a 9X13 pan. I used glass. Bake for ten minutes. While oatmeal layer is baking make cheesecake layer. Mix softened cream cheese, vanilla extract and condensed milk until combined. Add eggs and mix until incorporated. Top oatmeal layer with cheesecake mixture, spread evenly. Add jam in dollops on to top of cheesecake layer. Swirl into cheesecake layer with knife or handle end of a wooden spoon. Bake for 30 to 35 minutes at 350 degrees. Allow to completely cool before cutting. Best if cooled uncovered in refrigerator for at least two hours before cutting. To store leftovers, cover and refrigerate. 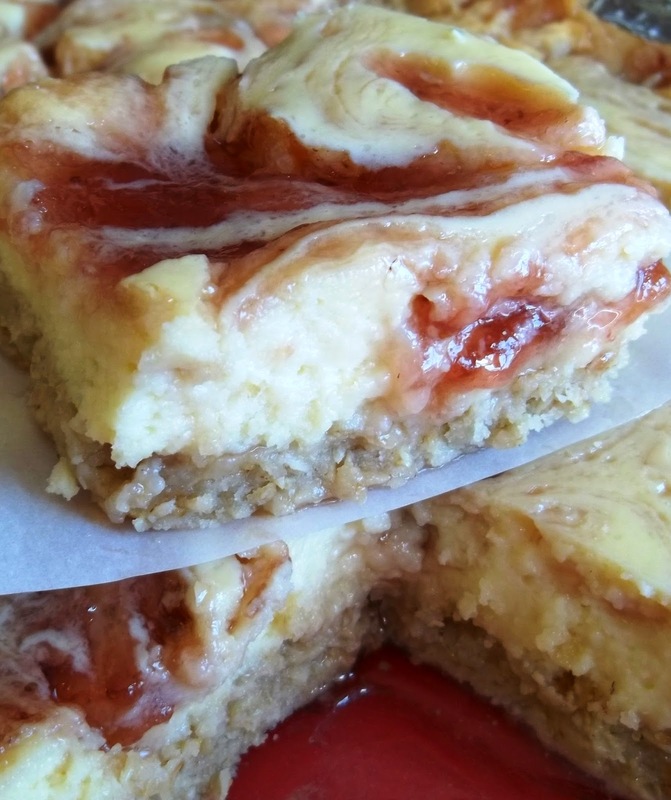 Christy, your strawberry swirl cheesecake bars look delicious. I am a big fan of cheesecake, so I am sure I would love these. Thank you Dawn, cheesecake is one of my favorites too. Thank you for visiting! Can't wait to try. Love cheesecake. Probably my favorite desserts. Thanks Nana B for stopping by! Cheesecake is always good! These look amazing I'm definitely going to make some! Hi Jill, thank you for visiting! I am so glad you want to make these, you will not be disappointed! G'day and thanks for sharing at our #SayGdayParty One word? YUM Pinned! Please make sure to revisit and Say G'day to the hosts and people at the party if you haven't already! Hi Joanne! Thank you for visiting and pinning! Hi Christy, this is my first visit to your wonderful blog. This cheesecake look awesome, love strawberry and cheese combo. :) Thanks for sharing your wonderful recipe. Hi Amelia, thank you for your kind words! The cheesecake was delicious. Thank you for stopping by! I picked you as my fav link up last week at Teach Me Tuesday party. Congrats! Thanks so much for linking up. Can't wait to see what you link up this week. Hope to see you there!! Thank you Bobbi! I am honored and excited! Will absolutely see you there. Have a great week! This looks delicious Christy. I love the oats in the crust, it's a nice touch. Thank you Shari, the oat crust was a perfect complement to the cheesecake filling. Thanks for visiting! This looks amazing! I love the crust make with oats. I just recently got my hubby to like cheesecake I will definitely be making these. Pinning! Hi Kristen the oat crust was so deliciously different, thanks for pinning! Thanks for visiting Heidy, always happy to link at Pure Blog Love. Oooh, these sound delicious! Strawberry is my #1 favorite fruit. This is a great way to use them. Thanks for joining us for Hump Day Happenings. Thanks Jenna, I love strawberries as well. Thanks for visiting, always happy to link at Hump Day Happenings! Ha ha, I can totally see why you say this isn't diet food. Looks amazing tho! Love cheesecake...yum. Hi Catherine, thanks for visiting and for hosting Marvelous Monday! Hi Dawn, Thanksgiving would be a perfect time to serve this! Thanks for visiting! Oh.my.goodness. These look amazing! I love the twist on the crust. Pinning for later! Thank you for sharing at Merry Monday! Thanks Amanda, the oatmeal crust was amazing! Thanks for pinning! Thanks Kimberly, always happy to link up with Lou Lou Girls! Hi Christy. I picked your cheesecake bars as my host favorite! Thanks for stopping by Foodie Friends Friday Linky Party! Hi Cindy and thank you! I very much appreciate it! They are delicious! These look entirely too delicious. Definitely pinning so I won't forget to make them! Thank you Stephanie for stopping by and pinning! I hope you get a chance to try them, you will love them! I am adding these to my grocery list for next week - decadent desserts are scarce around here, but this seems easy enough I can do it! 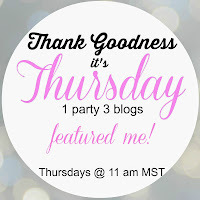 Thank you for linking up at the Thank Goodness It's Thursday party, Christy. Thank you so much for being a part of our #PureBlogLove link parties in 2014 - We plan on seeing in the new year with a BANG this Thursday evening and hope that all our favorite bloggers will join us! No worries if you cannot make it that night, remember the party runs weekly, Thursday-Monday morning! !